Scallops are some of the most beautiful and delicate meats, and are quite unique with their very distinct taste and texture. Scallops are also great in that they are quite easy to prepare and require only a short amount of cooking time. Overcooking scallops makes their meat go tough. Overcooking scallops also makes them lose some amount of their flavor. There are many different types of ways on how to cook and prepare scallops. 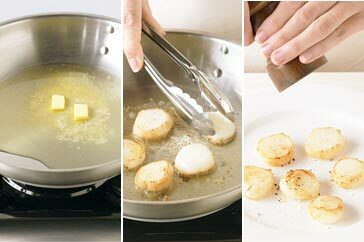 One of the most famous ways of preparing and cooking scallops is to pan fry them. The simplest way to pan fry scallops is to simply season them with salt and black pepper on both sides. Also make sure that they are dry before they get into the pan. Pan fry the scallops in hot vegetable oil. The hotter the temperature, the better your scallops will caramelize. Grilling scallops is another option, and gives the scallops a nice stronger flavor. In order to grill scallops, pat dry them first with kitchen paper and season well. Brush the scallops with melted butter before having them hit the grill. Poaching scallops is another great way to enjoy this fine shell fish. As with the other mentioned ways of preparing scallops, you first have to dry them and season them well. Poached scallops can be poached either in stock or in wine. All you have to do is to get your chosen liquid boiling and simmering and then simmering the scallops for about three to five minutes. Turn the scallops only once. As soon as both sides are done, the poached scallops are ready to be served.